The Making of Yoda (part two). The making of Yoda, Part II. Ergo: So what separates part I from part II ? Nick: The making of Yoda part I concentrated upon background information about the design, the principle people involved and the construction of the first puppet. Part II relates to several other versions of Yoda that were made to suit specific shots and circumstances. 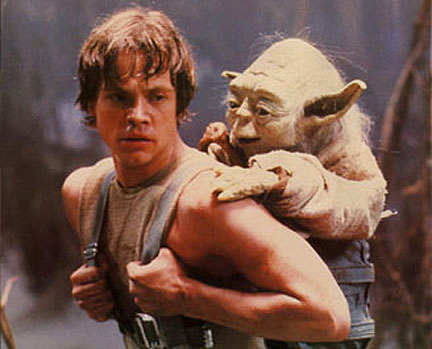 Nick: It was decided that a second version was needed specifically for the sequence where Yoda is in Luke's back pack. The glove puppet was good for the close-ups where you were too close to see Frank Oz hidden behind Mark Hamill. But for the longer shots of Luke running, walking etc. and where Yoda is balanced on Luke's foot, they needed a radio controlled version. At that time the make-up effects department did nothing that was radio controlled..... it was more than a year before Bob Keen and I started experimenting with that for an animatronic bear suit for THREE ON THE RUN, an ill fated TV pilot. Ron Hone was working with Nick Allder in the Physical Special Effects Department. He was supervising robot fabrication and he was the natural choice to build the two radio control mechanisms. Nick: One was a back-up. You don't want to wait till something breaks down before you start assembling another. That would take too long. 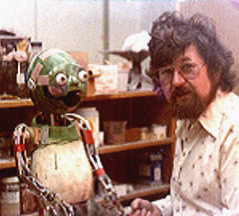 Since the mechanism was the slowest part (once the modeling and molding were complete) of assembling the rc puppet, Ron built two. In fact only one was needed. Ergo: Were these like complete little robots that could walk around? Nick: No. That wasn't necessary. Part of an HOD's job in not allowing the budget to get entirely out of control is to decide what is needed to get the shot and not spend a lot of money on features no one will ever see. Besides, making a robot that walks naturally is a huge task. The arms and legs were static and could be wired into any position to suit the shot. The eyes, eyelids, jaw and neck were radio controlled and the whole thing was self contained. It fitted perfectly in Luke's backpack. Mark could move freely while the operator was across the set somewhere. Stuart (Freeborn) was very caught up building the intricate brass mechanism for the first puppet. So he asked me to fit the skins I had produced to the mechanisms Ron had built. The hair was punched in (as it was on all the Yoda puppets) by Graham Freeborn and myself and then it was artworked. Ergo: What do you mean by "punched in" ? Nick: Well, there are two traditional methods of applying hair. The first is to make a wig, either from wefting or by knotting the hair, onto a shaped lace base, 3 or 4 hairs at a time. The second is to glue the hairs individually directly to the actor, mask or puppet... that system is known as "laying loose hair". Neither were suitable in this case. Loose hair was too delicate for a puppet that was used constantly for weeks and the hair was too whispy to use a conventional wig. On 2001 - A SPACE ODYSSEY, Stuart (Freeborn) had used an alternative system for the hair on the ape masks. I don't know for sure that he invented it but I think he may well have. Bails of synthetic (hair like) thread were threaded through hypodermic needles and punched right into the skin itself one hair at a time. On STAR WARS we used real hair and had to re-thread the needles on every strand. Ergo: You mean you had to thread every hair through the eye of a needle before you could attach it to the head ? Nick: Worse really, we were threading it through the full length of the shaft of a hypodermic where the fluid passes during an injection. Nick: We used the process extensively on Chewbacca and Yoda. 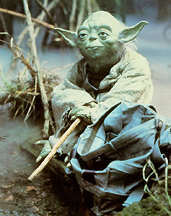 Ergo: Were there any other versions of Yoda that were made to suit a specific shot ? Nick: There was a double size version which had a midget inside for one shot at the end of Luke's first encounter with Yoda........ where you see him walking away through the swamp. Ergo: Was Kenny Baker in that? Nick: No, Kenny is a dwarf and his proportions weren't suitable. A midget is small but in proportion with normal people. I think we used Deep Roy for that shot. Ergo: Who made that ? Nick: I did. I used Di-iso-Octyl Phthalate suspended in Iso-proyl alcohol to expand a regular sized skin up to twice the normal size. Ergo: So you have to be a chemist as well as everything else. At that time we were using Windsor Hills foam and that was very sensitive to many materials..... so chemical expansion was a quick solution to the problem. Punching the hair into an ultra weak skin was very tricky but fortunately the figure was a long way away. Artworking the rather oily skin was difficult too. Ergo: So you assembled two versions of Yoda. Nick: Actually no. There is another puppet that we haven't discussed yet. Ergo: I guess that brings us to the Making of Yoda Part III!